Property owners preparing for a construction project face many obstacles that can lead to costly mistakes in time, money and resources. At Jobco, our mission is to help you obtain the optimum value for both the initial and long-term investment and to promote ease and efficiency during the construction process. Our commitment to excellence, quality and professionalism is how we enrich lives through better building. Once you, the property owner, become a Jobco client, our Pre-Construction Services staff provides the foundation for the successful completion of your project, large or small. We coordinate the efforts of the entire project team and establish realistic, achievable goals prior to the start of construction. During this stage, the roles of every member of the team are clearly defined, and the financial cost of the project is developed as the design is created. This thorough approach results in significant savings in materials and scheduling, as well as prevents costly problems that may arise during the construction phase. 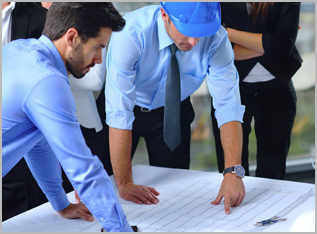 Conceptual Estimating: At this early stage, we provide cost estimates, budget reports and project schedules, all designed to proactively avoid costly mistakes in time and money by implementing a strategy of steadfast preparation. Value Engineering: This step lays out a set of disciplined procedures designed to seek out optimum value for both initial and long-term investment, as well as offer cost-effective alternative approaches. Design Review: The project’s design and site logistics are assessed in detail, examining such critical matters as Architectural, structural, Electrical, Heating, Ventilation and Air Conditioning, Plumbing, Fire Protection, Sanitary, and Site and Landscape. Constructability Review: This pre-construction phase involves identifying obstacles before a project is actually built to reduce or prevent errors, delays, and cost overruns. This phase also defines the ease and efficiency with which structures can be built.